Only four countries in the world - Lesotho, Swaziland, Papua New Guinea and the United States - fail to provide paid maternity leave to all workers? Canada now guarantees a full year of paid parental leave and California recently became the first state in the U.S. to provide such paid leave? Businesses that create flexible work environments find that productivity goes up, they attract more talent, turnover is reduced and their bottom line is improved? Other films by John de Graaf are AFFLUENZA, ESCAPE FROM AFFLUENZA, BUYER BE FAIR, SILENT KILLER: The Unfinished Campaign against Hunger, BEYOND ORGANIC, ON NATURE'S TERMS, HOT POTATOES, FOR EARTH'S SAKE: The Life and Times of David Brower, DAVID BROWER: A Conversation with Scott Simon, WHAT'S THE ECONOMY FOR, ANYWAY? and THE GREAT VACATION SQUEEZE. "It is very difficult to fit work and family issues into any kind of television or movie format, but The Motherhood Manifesto does it, and does it well. The stories range from heartbreaking to angry to enormously insightful, broken up by wonderful cartoon sketches, old clips from TV and movies, and interviews with leading experts. I'll be using it in class this fall. This is a great work and a movie that everyone should see!" "The Motherhood Manifesto is a funny, fascinating, informative, and finally, infuriating, film about motherhood in America. At the end of this one, you'll want to jump out of your seat, rush out the door, and start demanding change immediately!" "The Motherhood Manifesto is a sharp, funny, wry tale about some very unfunny social issues that mothers grapple with daily. If you have a mother, are a mother or know a mother, see this film." "Watch out. Apple pie is next. Motherhood has never been more disrespected in our nation than now. Seeing this excellent film, I was shocked to learn of mothers' struggles to earn a living wage and have time enough to love their children - who are, in fact, our nation's future. What a chilling commentary on how far we've come from our ideals when we can leave mothers out in the cold. Fortunately, The Motherhood Manifesto provides us with a path back to decency." "If you think motherhood is sacred in the United States, then think again. This humorous and often bitingly cynical film exposes the myriad impediments that willfully deny aid, comfort and security to mothers (and, by extension, their precious little charges!) in contemporary American society. As one watches this film, one cannot help but wonder why the world's wealthiest and most powerful nation would treat mothers so deplorably. More importantly, this film begs viewers to wonder how this sorry state of affairs can be rectified." "The Motherhood Manifesto mingles searing contemporary interviews, vintage clips from television's Golden Era, depressing labor and industry statistics, and satirical cartoon parody to draw viewers into the world of mothers seeking additional employment...The documentary's focus -- a lack of access to job opportunity and pay equity for women with children -- remains a sad commentary on U.S. priorities. Appropriate for audiences from middle schools through AARP members, The Motherhood Manifesto invites its viewers to question why a world economic power holds its women and children in such low esteem." "Motherhood Manifesto tells the stories that reveal the second class status of mothers in the U.S., and by extension, their children. The film demonstrates how workplace policies can benefit mothers and increase workplace efficiency and productivity. Viewers who are mothers will have their hardships affirmed, and legislators, policymakers, and employers will learn strategies to make our economy stronger with simple steps toward more flexibility in the workplace. An insightful analysis of the sexual politics of labor for students of gender and labor history and for decision makers in the workplace." "An important documentary that captures some of the most pressing social issues of the 21st century...The film clearly illustrates how negligent the U.S. has been in taking care of its families and children, and how little it would cost to provide the level of support that is offered to families in other industrialized countries...Engaging and informative." "Finally - a pro-families film that does not romanticize motherhood! The Motherhood Manifesto presents the sad facts about women's experiences, as mothers, with employment discrimination, childcare availability, sick leave policies, and health insurance coverage. Always engaging and sometimes humorous, it is a powerful college classroom teaching tool to engage students in re-examining their notions about 'family values' in U.S. policy. 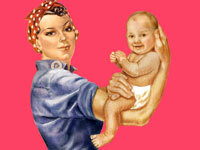 I will be using The Motherhood Manifesto in my family studies courses." Anita Itla Garey, Associate Professor of Human Development and Family Studies, University of Connecticut, and Author of Weaving Work and Motherhood. "The Motherhood Manifesto is an insightful, engaging, and timely film which gives voice to concerns felt by millions of American parents, advocates, service providers, social scientists and others interested in the well-being of children and families...Using tongue-in-cheek humor, illustrative personal stories, as well as thoughtful commentary from advocates, scientists, policymakers, employees and even employers, The Motherhood Manifesto persuasively makes the case that the time has come for the United States to 'catch up' with much of the rest of the world in terms of supporting and investing in working families." "Builds compelling arguments for women's pay equity, saner work hours, flexible and part-time work, child care programs, and universal health care for children. We hear the voices of mothers asserting what strikes this viewer as reasonable, even modest, demands for basic needs and a balance between work and family responsibilities...engaging and humorous...Timely." "Informative, infuriating, and eye-opening.....well-suited to both introductory and advanced students...thought provoking...[An] excellent stimulators of discussion." "Effectively points out the curious hypocrisy of American politicians who brag about 'family values' - holding up stay-at-home motherhood as best for children - yet refuse to put pressure on businesses to offer paid leave or allow federal tax breaks for the working spouse. Recommended." contains a 10-page, color, study guide with discussion questions and quick facts keyed to each of the six chapters, suggestions for student educational projects, and footnotes with links to websites. "Offers a wide range of information and testimonials from people with diverse backgrounds located in different parts of the country...It is a call for action to all Americans to mobilize towards a much needed solution to these problems. Highly recommended for discussions with focus on social and policy perspectives on childcare, women and work, working mothers, career and family issues." "Illustrates the point that, compared with other industrial nations, the United States is shockingly remiss in providing working conditions conducive to balancing home and work life...Recommended for public, school, and academic collections."